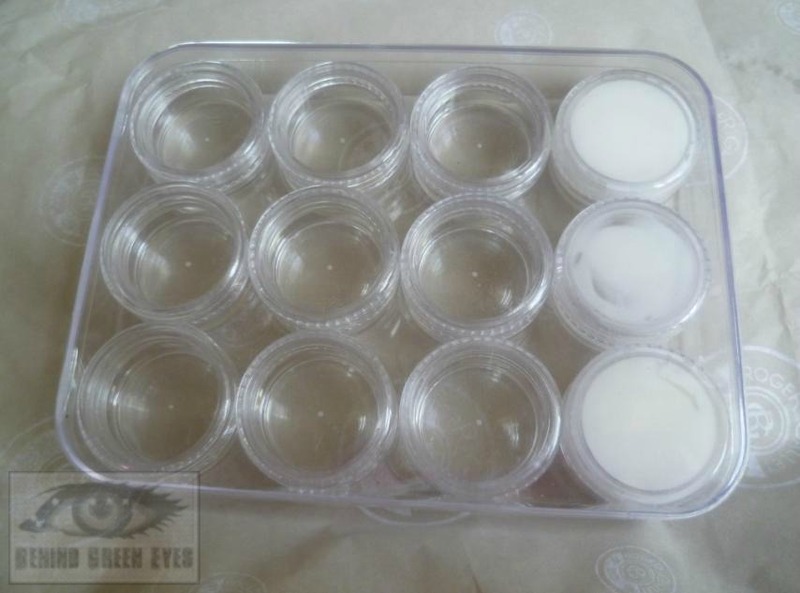 Behind Green Eyes: Sample Storage Solutions featuring Roger & Gallet! Sample Storage Solutions featuring Roger & Gallet! I love signing up for samples. Nappy cream, perfume, teabags - whatever. I went through a phase of signing up to every freebie forum I could find, until the novelty wore off and I just picked the ones I really wanted. Recently, I signed up for some lovely 3-in-1 Roger & Gallet samples (which, I may add, came in the most gorgeous packaging ever!). Included was a tiny little spray of Fleur de Figuier perfume, along with two 10ml sample sachets of body lotion and shower cream. I forgot to take pictures of the whole lot together, but I've devoured the perfume - it's absolutely gorgeous and so different to anything else I own. I got so many comments on it, it was unreal. It's gone straight onto my wish list. I've saved the shower cream for another time, but what inspired this post was the body lotion. I treated myself to a full-sized Lait des Bienfaits (I have no idea how to pronounce that, in my head I call it Lady Beyoncé) body lotion a while ago. At €14.95 a pop, it's not something I can afford to repurchase on a whim, so I've been trying to make it last. The same went for the Fleur de Figeur sample. The sachet contained a very generous 10ml, and I fell in love with the fragrance immediately. There's no way in hell I can justify another €15 on lotion with two babies imminent, so I wanted to save this and use it sparingly. How the hell do you save a sachet that's been opened? I bought this little set of 12 empty pots on eBay here a while ago for the very silly price of €1.39. They took about two weeks to arrive from China. Initially, I bought them with the intention of storing nail art supplies, but I realised they'd be ideal for makeup. I got three little tubs full of the lovely body lotion from the one sample - a little goes a very long way when using Roger & Gallet products, there's no need to lash them on. I use this on my arms after a shower when I feel like I want a luxurious treat - I've used it about 3 times now and I still have two full pots. These storage pots would also be really handy if you want to test a foundation at home - I can't imagine many pharmacies having a problem if you asked to put a few pumps of a particular foundation or cream into one of these pots so you could test it over a day and see how your skin reacted to it. They'd also be handy if you were going away for a night and wanted to take some hand/eye cream, you'd easily get one or two goes from one little pot. You could fit more than enough Argan Oil for one treatment into one too. That is just brilliant. I am totally going to get those little pots, thanks for sharing this tip. Great idea! Loved the sample I got of the Roger and Gallet too. Probably the most generous sized sample I’ve seen in a long time! Same here! Really generous of them, it was far too lovely to use all in one go! What a clever idea - and they would be so handy for travelling too! That's a great idea! I was only recently pondering what to do with open sachets! Very handy, I end up using samples once and wasting the rest. Great idea. And I heart River and Gallet, a real treat. Their candles are to die for. NOTD: Inspired By....A Sock? Plus, #SBBC! Etsy Purchase: Glimmer by Erica Twilight Sky. Friday Treat: Win a £40 ASOS Voucher! Parcel Motel - What is it?